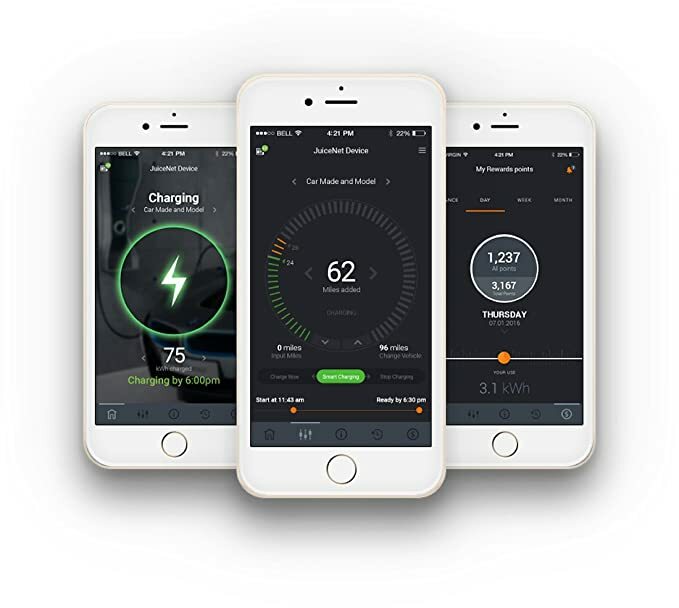 AeroVironment EVSE-RS, JuiceNet Edition is a smart-grid enabled version of a leading AeroVironment EV charging station. It will automatically adjust to provide just as much power as your EV is able to accept. This unit is ready to be hardwired by a qualified electrician. At 32 amp (7.6kW), the ClipperCreek HCS-40 charges up to 10x faster. Monitor, manage, and control your charging experience via voice commands on Amazon Echo and Google Home. Don't let life pass you by. With indicator lights showing the current charging status, you will never miss a beat. (Includes an integrated cord hanger). Weather resistant 25-ft cable. The unit is rugged, weatherproof and durable. See eMotorWerks guide to learn more and visit our Electric Vehicle Buyer's Guide. Your charging station will act as a standard charging unit in absence of wifi. If you set it up on wifi but then disconnect it, any schedules or limits you set when connected to the station may remain even if the station is not connected to wifi. Wi-Fi memory will be erased upon unplugging from power and will be reinstated once connected to wifi again. The JuiceBox Pro 40 is a high power, fully ruggedized, portable charger that plugs into a variety of 240V outlet types.